Motivated Seller has reduced the price to make this one of the BEST SINGLE FAMILY VALUES in the beautiful community of Palmira Country Club!!! 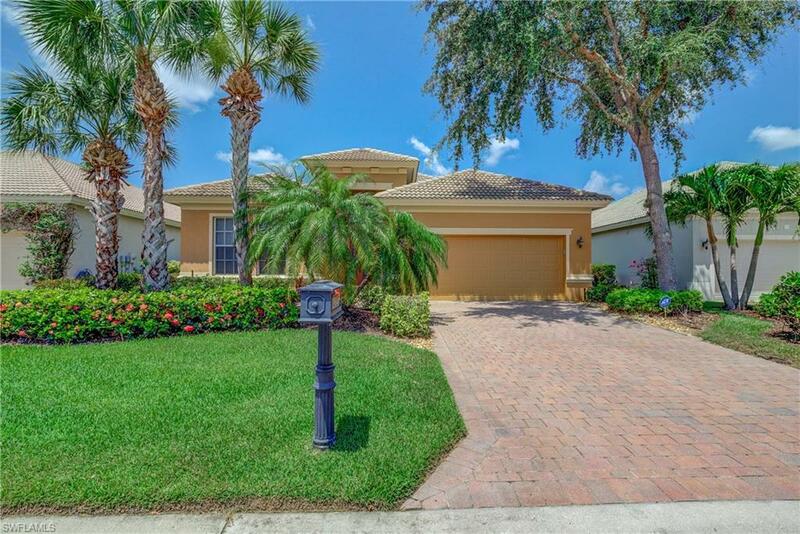 Enjoy fabulous sunsets and long golf course views from the lanai of this 3 bedroom and 2 bath private home. Lovingly maintained and thoughtfully upgraded with desirable features such as electric hurricane shutters on the front door and lanai, granite kitchen counters with tile backsplash and new designer lighting, crown molding, custom paint, pavers and "super screening on the lanai, updated A/C and pool pump. A custom built in office in the third bedroom gives added flexibility! There is nothing left to do but move in and begin Southwest Florida living at its best. Furniture is available to be purchased separately. This is truly a pristine home for the discriminating buyer!All Palmira residents enjoy a wide range of amenities including membership to the Renaissance Center which features a resort-style lagoon pool, dedicated lap pool, state of the art fitness center and media room as well as a very active tennis center. Additionally the member owned Palmira Country Club offers 27 holes of Championship Golf on a membership basis.